We always like to talk and blog about upgrading the brakes or suspension or engine. Sometimes however you have to deal with the boring stuff too. The NA MX-5 electric windows are a resilient but slow design. They raise or lower in geological time scales. If you first pull up at an access controlled gate and then only wind it down to put your arm out, the queue will be hooting and shouting behind you before it’s even halfway. To make things a bit easier I regularly spray Q-20 (WD-40) down the weatherstrip that also guides the window along the quaterpane. This mostly works but doesn’t last for very long. After 25 years however, the passenger side weather strip decided it'd had enough and tore open around the corner of the quaterpane frame. The result of that was the glass itself pulling the strip out with it every time you wind it up. So I ordered new ones through the local dealer this time. And I have it on good authority that this new pair of weather strips were the last pair at the factory in Horishima. After removal of the old rubbers, I cleaned up all the old dust and grime that had built up on the surface first. The removal and fitment is really easy. Both took me about 20 minutes per side. The glass comes with some stoppers which you have to remove while it’s still in the doors; give it the reach-around for that. The weather strips are basically fastened with a bunch of plastic clips, with the exception of one screw each side on top of the quaterpane frame. I really struggled and ultimately failed to get these screws to take thread to tighten it back down again. Their holes are heavily rusted and I probably stripped them on the first try. The clips are destroyed in the process of removal. Fortunately the weather strips came with clips attached, but I had ordered additional ones in any case. When fitting the new strips, I started by feeding the window guide in first for the driver's side, and on the passenger side I first clipped in the main part of the strip and worked around the quaterpane last. There wasn't much difference in the two approaches. Both had the same trouble getting the rubber into place up the quaterpane, and getting the corner seated around the very sharp metal edges at the apex of the quaterpane. I used a credit card and a sharpened toothbrush to help me pry it in without damaging it (never use any metal tools with weather strips and rubber parts in general). 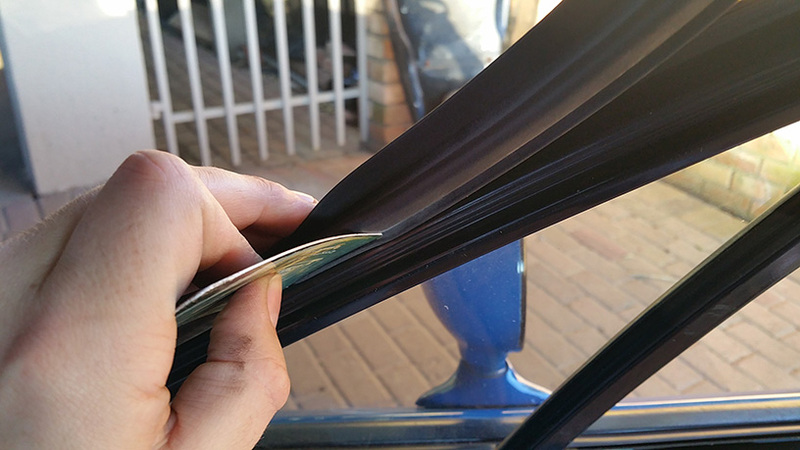 Feeding the rubber into the window guide, using a credit card to slip the rubber in place over the quaterpane, and finally pulling the corner into place very carefully over the sharp edge. While fitting that, I noticed that the rubber-surround of the front windshield had started lifting around both top corners. There’s nothing worse than A-pillar rust (apart from rear quarter panel rust), so prevention is key. I got some more Sika and proceeded to fill it in. It came out ace. All taped up around the corner of the window frame. The gap under the rubber seal is clearly visible. Copious amounts of Sika pasted and pressed into the gap. I made sure that most of it goes into the gap. Cleaned it up a bit without squeezing the sealant out of the gap again, and then I removed the tape while the Sika was still wet and pliable. All done! After it has settled and dried I will trim it slightly with a small razor blade, but it's hardly noticeable at all. What does a 25 year old Mazda and a new JEEP Renegade or Wrangler have in common? Let’s just say, it’s remarkable how engineering standards and convention has held up over time, cultures and continents.